Leading global manufacturer of leisure products for camping/caravanning and RV market. Portable folding solar panel kit - 12 volt, 180 watt. The Dometic PS180A is a must-have for owners of portable fridges and other powered devices. The Dometic PS180A features highly efficient monocrystalline panels, which are more efficient in converting sunlight to usable energy and have a longer lifespan than other technologies. It has an inbuilt 20 A heavy duty voltage regulator and adjustable feet so that you can direct it towards the sun throughout the day. The Dometic PS180A also features a built-in battery temperature sensor, which measures the temperature of the battery and allows it to be safely charged, removing the risk of overcharging. 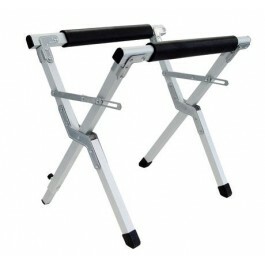 The frame is constructed from strong aluminium and is built to perform in the harshest conditions. Dometic Waeco CFX Portable Fridge Stand. 2 height positions: H450 x D330 mm & H310 x D450 mm (± 20 mm). A great addition to your Dometic Waeco Portable Fridge to get your fridge up off the ground and at an easier height to reach the contents. Dometic WAECO COOLPOWER RAPS44 IS THE NEW LONG LASTING PORTABLE 12 VOLT BATTERY. 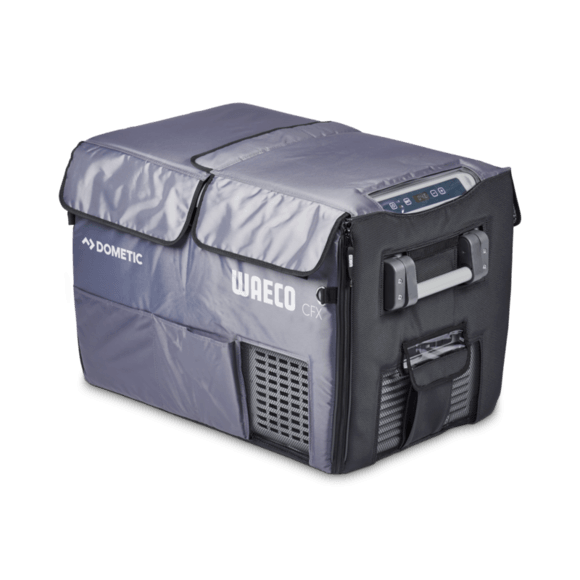 The Dometic WAECO CoolPower RAPS44 portable heavy duty12 volt battery is the ideal choice for running a portablecompressor fridge/freezer for long periods of time. Like the RAPS36, the upgraded version RAPS44 is a genuine Dometic WAECO manufactured rugged deep cycleportable 12 volt battery pack with superior discharge/charging cycle capability and now with 44 amp hours. Specifically designed to run Dometic WAECO compressor fridge/freezers, it has the benefits of dual battery systems that are normally fitted permanently into cars, 4WD’s, trucks and boats, except that it is portable for added flexability and convenience. Designed for portability with an ergonomic handle, the CoolPower RAPS44 is easy to take camping and set up alongside the Dometic WAECO portable fridge/freezer anytime and anywhere. Genuine Dometic WAECO manufactured rugged deep-cycle battery with superior discharge/charging cycle capability. Features include cigarette and hella style sockets, digital volts display, empty and full LED lights at the press of a button, secure screw connection for your charging lead, + and - charging posts for easy connection to Dometic WAECO electronic chargers. The inside features genuine 44 Ah deep-cycle AGM battery cells, thick plates for reserve energy storing with high density active paste material and stronger acid than conventional car batteries for degradation resistance. These features allow for a longer life in deep-cycle applications, allowing you to run your fridge for longer without damaging the battery. The RAPS44 works best with portable fridges up to around 65 litres in size. For larger requirements, two RAPS44 units can be purchased and cradled together with the RAPS72 Battery Craddle Kit (See Accessory List above). Cigarette and hella output sockets. Secure screw connection charging socket. Dometic Waeco CFX Universal Fixing Kit. Suits all Dometic Waeco CFX models. Also suits earlier Dometic Waeco CF models with handles, including Dometic Waeco CF40, Dometic Waeco CF50 and DometicWaeco CF80. The Dometic CFX fixing kit is a CFX accessory you won't want to live without. If you are travelling on bumpy roads, having your cooler secured with a fixing kit is advisable, as it helps the fridge move with the suspension of the vehicle. Designed to suit all CFX portable fridge and freezers, the fixing kit is a way to secure the fridge into the vehicle to avoid it sliding around when on the move. It is safe and reliable with four fixing points, low profile tie-down anchor points, strong metal D-ring, shake proof nuts, heavy duty straps and quick release buckles. If you are travelling on corrugated roads, having your fridge restrained with a fixing kit is a safe option and helps the fridge travel with the suspension of the vehicle. Suits Dometic Waeco Fridges: CFX-50, CFX-65 and older model: CFX-65DZ. This fridge slide is designed to fasten the CFX-50, CFX-65 and CFX-65DZ portable fridge and freezers into vehicles and allows easy slide out access to the fridge. While keeping the fridge secure it also makes it convenient for loading and unloading. Ball Bearing rollers that allows the fridge to easily slide in and out of your vehicle for quick access to the fridge contents. DOMETIC WAECO CoolPower RAPS12R-U2 12 volt fridge power wiring kit - heavy duty to suit all DOMETIC WAECO compressor fridge/freezers. Heavy-duty to suit all DOMETIC WAECO compressor fridge/freezers. Highly recommended for replacement of standard vehicle cigarette lighter sockets which are often inadequate to properly run fridges due to thin wiring and associated voltage drops. "Just the solid and quality fridge"
I was expecting worst, I read dozens reviews and all point out some issues like consuming too much energy, temperature unstable and so on. I must admit that it exceed my expectation. Bought fridge plugged in to auxiliary battery and went for camping the next morning. 4 days later without moving my vehicle ( to charge the battery) the fridge was still on, temp stable -1°C food OK.
My generator... I bought fridge on Monday and it was delivered on Thursday same week. Fast with no dramas. I even called if they can deliver same week, got response "no worry mate all sorted". This is a very well built fridge, better than my Engel, and better still you can control it with your phone !! Absolutely love the Waeco CFX50W and bonus pack, has never skipped a beat on the camping trips I have taken it on so far, love the real time battery monitoring through the waeco app. Also doubles as my beer fridge at home from time to time. Shopping through my generator was very easy, staff were helpful and postage was prompt, would definitely shop with my generator again. "LOVE IT and BIG THANKS to Service MyGenerator for recommended"
Love it. Has plenty room and is light, I can lift myself easy. Very good when on cold and can freeze all the food without any issues running with car battery .. excellent .. roomy and easy to control this with my mobile Apps. Wanted to say big thanks to the staff member of MyGenerator that chatted to me online because I am deaf so cannot use telephone. He is very good at explaining this Waeco CFX-50W with specifics etc etc. and I am very happy we chose it and purchased one from him ..
Great Product. Does what it says it will do, energy efficient, cools well in the back of a hot car. Well constructed. Really happy with it. We're currently using it as a second freezer (to the one in our caravan) and use the "dairy compartment" for lunch on day trips. Great Service, quick delivery, when enquiring My Generator were very knowledgeable about the product. Would purchase through them again. Currently FREE with the Dometic Waeco CFX-50W Portable Fridge / Freezer is a Dometic Waeco insulated Fridge Cover! The insulated protective cover allows your fridge/freezer to take on any challenge. The cover protects from moisture, dust and dirt. It also provides effective insulation, improving the cooling capacity and therefore the energy consumption even further. Extra insulation against strong sunshine or extreme outside temperatures. Saves battery power, improves overall efficiency. NEW Dometic Waeco CFX50W is a high performance portable fridge/freezer, 50 litres with CFX VMSO2 electronics. Built to last, this unit is tough, practical, efficient and comes with loads of extras, making it the leading 50 litre portable fridge/freezer on the market - backed by a five year warranty. The Dometic CFX50 is an efficient and robust portable compressor single zone fridge or freezer designed to keep your food and drink fresher for longer. Simply choose the temperature between +10 °C and –22 °C to best suit your cooling or freezing needs. Take it with you in the caravan, camping or on the boat, basically anywhere you have access to 12 or 24 V DC or 100–240 V AC (and it is also suitable for solar operation). The CFX-50W comes with a basket, features a dairy compartment for perishables and can fit 72 cans and up to a standard Riesling bottle upright. The CFX-50W also comes with a Wi-Fi CFX app that allows you to set, control and monitor the temperatures of the compartment from your smart phone or tablet. The genuine Dometic WAECO compressor and unique Variable Motor Speed Optimization technology helps the CFX range operate efficiently, even in extreme conditions. We are first time owners of a Waeco !! and don't know why we waited so long. CFX-50 very roomy, received good Bonus pack too, love the cover it looks great. I have used waeco fridges before and I am very pleased with the CFX50 I purchased. Great product & Bonus Pack, Cover looks great on the fridge. From time I put in the order for the the products, I received them very promptly. Good service quick delivery Great people to deal with. Q:What is the smallest size solar panel I can use to run my CFX fridge? Hi, please take this advice as general, because there are many factors that can influnce the power consumption, such as ambient temperature and fridge/freezer temperature settings. Overall, it is advised that at a bare minimum an 80 watt standard solar panel is used, however to ensure you have more than enough power in all conditions, around a 120-160 watt solar panel is often the best option. Remember its best to use the solar panel to charge a battery, as opposed to running the fridge directly from the solar panel as voltage will drop if clouds come overhead for instance. Q:Looking at a camping fridge. What are your thoughts on an Engel compared to a Waeco? The Engel Platinum series of fridges have a steel cabinet, steel lid and steel handles...some people prefer the steel exterior (particularly farmers) as opposed to the rotomounted material used by Waeco. However, the steel material typically makes the fridge slightly heavier when comparing models on a like for like size basis. The Waeco CFX range have a couple of small extras worth noting, including; USB charging outlets, drop down handles, drainage plug and ability to remote monitor. If you're still in two mind between the two brands, then perhaps look at the pricing and see which model is cheaper in the size you need. Thanks! Q:In the specifications, there is a reference to ‘nutserts’ – what are these? The nutserts on the base of the fridge relates to the ability to fix the fridge to the Waeco Fridge Slide Out Kit or fix the fridge to a surface. Q:When turning on a warm fridge will the Waeco CFX range draw more power? If so, how much higher than the average power consumption? Any compressor fridge will draw more power when first starting up, compared to when its running stable on the thermostat. The average power draw (from both 240V AC and 12/24V DC) is listed in the specifications for each model. If you are concerned about conserving power when starting up, a good tip (if possible) is to put your fridge on 240V power for 24 hours before leaving on your trip. That way when you put your fridge in your vehicle to run on your battery source, the fridge is already cooled to your desired temperature for your food and drinks. Q:What are the battery protection levels on my Waeco fridge, and what should I set them to? Q:How long will my camping fridge run for from my battery? How long will my refrigerator keep running for on my battery? You need to ascertain how much power your refrigerator will consume on average per hour under certain ambient conditions; we provide this information under the Specifications section of the product. You also need to know the size of your battery in amp-hours. Once you know these figures, you can divide the size of the battery by that average consumption figure (multiplied by 24 hours) to give you approximate run time. e.g. If the stated consumption is 1 amp per hour average, multiply that by 24 hours. (equals 24 Amp hours per day). You should understand that you never get the full amount of amp-hours from a battery however. You should use 80% as a good rule of thumb. So if you have a 100 Amp hour deep cycle battery, you can assume 80 amp-hours of usable power. So if a refrigerator consumes on average 1 amp per hour, and is the only appliance running from a 100 amp-hour battery, you should be able to have the refrigerator run for around 80 hours before recharging becomes necessary. Q:Can I run my waeco fridge on its side/end? Q:Can I leave my Waeco fridge plugged into 12Volts DC and 240Volts AC at the same time? Yes you can. If both power sources are available to your WAECO CFX fridge, it will automatically select 240 volts AC as the priority so that you are not consuming battery power. Q:What Solar Panel do I need to run my fridge? The panel should be of a suitable size to meet requirements of the refrigerator and any other appliance running from the battery. Its best to use the solar panel to charge a battery, as opposed to running the fridge directly from the solar panel as voltage will drop if clouds come overhead for instance. The battery means your refrigerator keeps running even if the voltage output of the solar panel drops severely due to cloud cover. A good rule of thumb to prevent inadequacies with power supply is to have a solar panel large enough to provide enough daily power to run your refrigerator, and have battery storage of an extra 2/3 on hand. So, if your refrigerator (or any other appliance) will consume 30 amp-hours per day, you should have battery storage of 90 amp-hours capacity and a solar panel of around 80 watts or greater capacity to ensure you won't have problems. It is advised to go a little higher in specification than your needs, however. A popular solar panel size to charge your batteries to run camping fridges is around 120 - 160 watts. Q:What temperatures should I set for fridge and freezer operation? Typically your home refrigerator would be running at between 2 and 4 °Celsius which is optimum for good food preservation. With camping refrigerators, some campers choose a temperature a little higher than that to conserve battery power. With Dometic WAECO CFX portable refrigerators you are able to select a temperature to suit your needs in 1°C increments. For freezing, your home deep freezer would operate somewhere between minus 18 and minus 20 °Celsius. For camping applications however, minus 15 ° Celsius would be more than adequate and also conserve battery power. Q:What are the main differences between the older Waeco CF portable fridge models and the Waeco CFX portable fridge range? Hi - Firstly, all of the Waeco portable fridge-freezers are made with CFC-free Polyurethane foam for optimal cooling performance, can run on either 12/24 volt or 240 volt power sources, comprise electronic thermostats, come with three stage battery protection to ensure safe use, and have variable speed optimization for economic operation. The Waeco CF range are cheaper and come with a protective insulated cover as standard, making them a very good value proposition. Overall, we would sell slightly more of the CFX models because even though they cost a bit more, they come with a longer warranty and perform slightly better. However, if you are on a tighter budget, then the CF range presents a compelling value for money case! Q:What type of compressor do Dometic fridges use? Most Dometic fridges feature the "Dometic Waeco Compressor" - it is the newest and most technologyically advanced camping fridge compressor on the market. 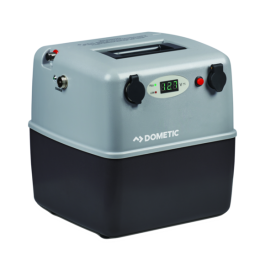 The Dometic Waeco Compressor boasts unrivalled cooling power. So, how does it work? It relies on a refrigerant that changes from liquid to gas in the evaporator. This evaporation process extracts heat from the interior of the cooling unit, causing the temperature to drop. The compressor then draws in the refrigerant, compresses it and passes it on to the condenser. From here, the absorbed heat is released into the atmosphere. The refrigerant liquefies and flows back to the evaporator, where the cycle begins again. The result is an exceptional cooling performance, so much so that it’s capable of deep-freezing items even at extreme ambient temperatures! Q:** Dometic Troubleshooting Tip ** - Is there enough voltage from your cigarette socket? If your fridge does not run properly or stops and starts erractically there is a good chance low voltage is the problem. The fridge is designed to shut down and save your battery if the voltage gets too low. The problem can be the wiring to the vehicle socket or even a dirty socket. Q:Hi, I want to use my 90amp hour camping battery to run a portable fridge. How many hours will I get from my battery before needing to recharge? And what solar panels should I use to charge the battery? Hi Greg, great question. It is good that you will use the solar panel to charge the battery, as opposed to running the fridge directly from the solar panel, as voltage will drop if clouds come overhead for instance. You can run the fridge direct from your solar panels if you wish, but using the battery means your refrigerator keeps running even if the voltage output of the solar panel drops severely due to cloud cover. Presumably your 90amp hour battery is an AGM / GEL / Lead Acid type, meaning they have an approximate 'Depth of Discharge' of around 50% - so you can only use around half the capacity of the battery before you need to recharge. For Lithium batteries, you can get down to around 20% of capacity (sometimes more), however lithium batteries are more expensive. So, your battery model has around 45 hours capacity before you need to recharge. A portable camping fridge of say around 40-50 litres in size will draw approximately 0.75 amps/hr*. Meaning you will get approximately 60 hours of total run time from your battery before needing to re-charge, assuming you are running just your fridge and nothing else. Obviously different brands and models have different power draw ratings and a larger portable fridge will draw more power than a smaller model - best to check each fridge model's specifications for precise power draw data. Now looking at solar panels and the fact you may also want some other small camping appliances as well as the fridge: A good rule of thumb to prevent inadequacies with power supply is to have a solar panel large enough to provide enough daily power to run your appliances, and have battery storage of an extra 2/3 on hand. So, if your portable fridge plus some other small camping appliances consume a total of say 30 amp-hours per day, you should have battery storage of 90 amp-hours capacity (like your battery does) and a solar panel of at least 80-100 watts or greater capacity to ensure you won't have problems. It is advised to go a little higher in specification than your needs, however. 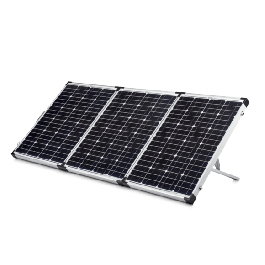 A popular solar panel size to charge your batteries to run camping fridges is around 100 to 160 watts… a quality 160 watt portable solar panel should give you around 60 amps per day of charging, assuming around 7 hours of decent sunlight. So based on the above, a 160 watt sized panel could be a good option for your sized battery - this should give you enough daily power to comfortably run a standard sized portable fridge and some other small appliances if required. Thanks. *Note that average power consumption data depends on things such as ambient temp, compressor speed (fridge setting), temp of contents in fridge, etc. So treat this numbers as approximation to give you a 'thereabouts' guide. If it works normally on 240 v mains power, then the problem is almost certainly with your vehicle wiring, not the fridge. Q:** Dometic Troubleshooting Tip ** - Does the fridge shudder once every minute or so, or stop running with your ignition in the accessories position with the car engine stopped? Does the red light or power light flash once every 5 seconds? If the answer is yes to any of these points there is almost certainly nothing wrong with your fridge. You have a voltage loss problem in your vehicle wiring or cigarette lighter socket. Q:** Dometic Troubleshooting Tip ** - Is the high/low battery cut out switch in the high position? Q:** Dometic Troubleshooting Tip ** - Have you cut or extended the cable supplied? Unless you do this correctly you will prevent your fridge from getting enough voltage to operate correctly. The cable provided is the minimum thickness required for that length. Are all ventilation slots unobstructed? Good refrigeration must have good airflow - especially in hot ambient temperatures. If you have any of the voltage loss symptoms described, you simply need to install thicker wiring from your battery to your lighter socket. Your fridge and all other 12 volt appliances will operate as they are meant to, reliably, efficiently and trouble free. Dometic has a wiring kit available for this purpose or you can ask any auto electrician to replace your cigarette lighter wiring. Ask for 6mm cross section wires as a minimum.